From Amazon - What happens when a two-headed cowboy, a high school dropout, and a poet abducted by aliens come together in 1970’s Moab, Utah? 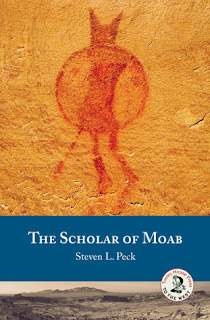 The Scholar of Moab, a dark-comedy perambulating murder, affairs, and cowboy mysteries in the shadow of the hoary La Sal Mountains. Young Hyrum Thayne, an unrefined geological surveyor, steals a massive dictionary out of the Grand County library in a midnight raid, startling the good people of Moab into believing a nefarious band of Book of Mormon thugs, the Gadianton Robbers, has arisen again. To make matters worse, Hyrum’s illicit affair with Dora Tanner, a local poet thought to be mad, results in the delivery of a bouncing baby boy who vanishes the night of his birth. Righteous Moabites accuse Dora of the murder, but who really killed their child? Did a coyote dingo the baby? Was it an alien abduction as Dora claims? Was it Hyrum? Or could it have been the only witness to the crime, one of a pair of Oxford-educated conjoined twins who cowboy in the La Sals on sabbatical? Read this book! Seriously. This is probably one of the most bizarre books I have ever read, but it's just that good. I couldn't put it down, I was so engrossed in the story. I laughed so much I was crying. There is a lot going on this remarkable book set in Moab, Utah in the nineteen seventies. I'm not going to go into details because the description above gives enough about what the book is about and I don't want to give anything away and spoil it for you. I will say that the it's a mesh of Mormon culture, philosphy, conspiracy theories and brilliant writing. The cover of the book left something to be desired when I first received it, but actually fits the story perfectly. There is pure gold within these pages and I am still thinking about it days after I have finished it. Probably one of the best books I have read this year! Buy one for yourself and for your family and friends! It's brilliant! *I received a copy of this book in exchange for an honest review.